The word bolognaise translates as ‘in the style of Bologna’. As well being the regional capital of the Bologna Province and the Emilia-Romagna Region in northern Italy, bologna is a large Italian styled North American smoked sausage, usually containing a combination of finely ground and seasoned meats including beef, pork, lamb, chicken or turkey. An authentic Italian bolognaise sauce is more correctly referred to as a ‘ragù’, this being a meat based sauce traditionally served with a pasta. Ragù is a phonetical Italian spelling of the French word ragout, which is derived from the old French ‘ragoûter’, meaning ‘to revive the taste’. 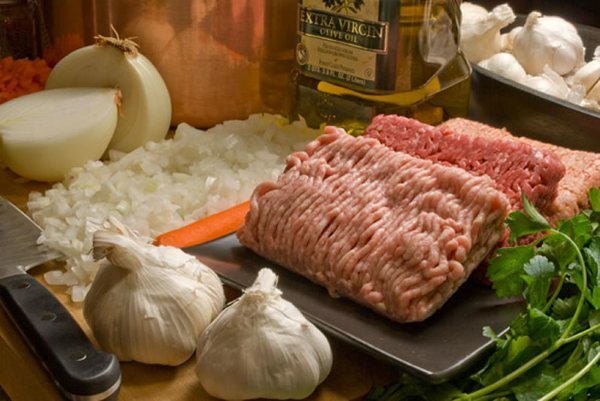 As with most cuisines methods for bolognaise vary across Italy, but a typical recipe would always begin with a ‘soffritto’ of finely diced onions, carrots and celery. This is fried in olive oil and butter until caramelised, then seasoned with garlic and herbs. Assorted fresh mushrooms are then added and cooked until tender. The meat is then added which is usually a blend of three finely ground meats. Pork, veal and lamb could be used but goose liver is also a popular addition. Next milk will be added, this renders the meat flavours more delicate. Sometimes cream may be used, but only in small amounts. The mixture is then brought to the boil. Red wine and a quality stock is added along with a little tomato paste. The ragù is then seasoned and allowed to simmer gently for around 6 hours. When ready the sauce is served with a fresh pasta such as ‘tagliatelle alla bolognese’. An authentic Italian bolognaise contains little tomato, would not necessarily include beef and would never be served with spaghetti. Spaghetti is a smooth textured pasta and so would not be able to retain any of sauce when served. The sauce would simply slide off the pasta and back onto the plate. A rough textured pasta such as tagliatelle is always used as this retains the bolognaise sauce. once again – YUM!!! bolognese is probably one of my favorite italian dishes! really! i especially love making it for my toddler (and even hubbie) since it’s a good way to sneak in some veggies (i.e, carrots/celery) into their diet! thanks for sharing this recipe. i’m always looking for new ingredients to try – goose liver? a definite possibility! i also did not know i’m supposed to saute the soffritto until caramelized. good to know! Hmm. So, I think this is a good recipe, will make something delicious.. I’m wondering what your source is for the background? I actually went to culinary school in Florence and took a regional class, among other things, and one of the dishes we made from Bologna was this. And it was completely different. And Italians don’t caramelize their vegetables (sotofritto, etc) like the French do. They consider it overcooked. So just wondering how we both ended up knowing and feeling 100% we know authentic bolognese but the recipes are totally different? My recipe is on my blog, if you search for it. I think this is a really interesting recipe and look forward to giving it a try. I love Bolognese! Bolognese…..there’s something so comforting about a good dish of Bolognese. Thanks for sharing this post.